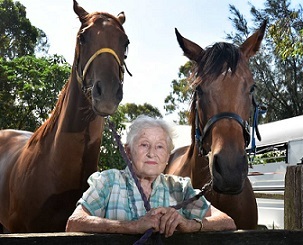 Port Macquarie trainer Margaret De Gonneville is one of horse racing’s treasures. It’s well worth googling her name to find out why, if you’re unfamiliar, but let’s just say she can tell some stories about the early days of women in racing. Among those tales is one of teaching Gai Waterhouse’s cousin Denise how to ride and regularly galloping the mare named after her, the legendary Denise’s Joy, and in 1977 was the first female jockey to win a registered race in Australia. She’s also very competitive, still in love with the sport, and on Sunday will have her first runner in the MNCRA Country Championships Qualifier (1200m) at Port Macquarie with the promising Golden Comet. “I’ve always been up early all my life, being on a farm, some people are early birders and I thoroughly enjoy the exercise,’’ De Gonneville said. “I could still ride at 54kg if I had to. It’s been a while since I’ve been in the saddle, I’ve had a hip replacement and a couple of ankles pinned so my riding stopped about 20 years ago. De Gonneville trained at Canterbury in Sydney for a few years before its closure as a training centre, then moved to Rosehill, and has been based in Port Macquarie for 12 years. Her biggest success came in the Breeders’ Plate in 1983 when My Mate Zero downed subsequent Golden Slipper winner Inspired. These days she has only a few horses in work including Golden Comet who earned his shot in Sunday;’s Qualifier with a first-up Port Macquarie win on February 1. “He has a wonderful will to try. He has a bit more than average ability plus he is so honest,’’ she said. Golden Comet is also “quite a character’’ and De Gonneville has many a story of him dumping trackwork riders as he learns what racing is all about. The four-year-old put it all together, though still racing greenly, first-up and is all set for his first try at 1200m. “There is still improvement in him because he hadn’t raced for nine weeks,’’ she said. “He’s always been a wayward horse, he’s dumped riders and he’ll whip around quickly if he sees things. “After he won a while ago he was pulling up and another horse got close to him so he whipped off again and Jeff fell off. De Gonneville, who says she’s been “70-again a few times’’, is banking on jockey Jeff Kehoe getting the horse to settle in his race on Sunday in order to run out the trip. If he does that then she’s confident he can be in the finish and give her cause to take a horse to Sydney for the first time in a number of years. “He’s won over 1100m but Jeff always said he will stick on a bit so now he is settled there’s a possibility he will run a strong 1200m on his home track,’’ she said. First and second from the Port Macquarie Qualifier earn a spot in the $500,000 Newhaven Park Country Championships Final (1400m) at Royal Randwick on April 6.